Stitched Together: Ribbon and Ring Cowl Pattern - Now Available! 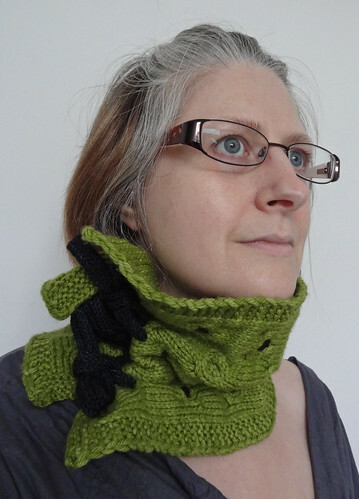 Ribbon and Ring Cowl Pattern - Now Available! 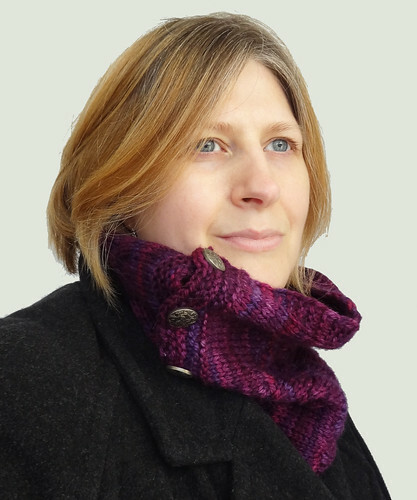 You will be pleased to hear that I have finally got my act together enough to do a final read through, of my latest cowl pattern, after my testers finished weeks ago! As you can see from this photo, the cowl is fastened using "ribbons". 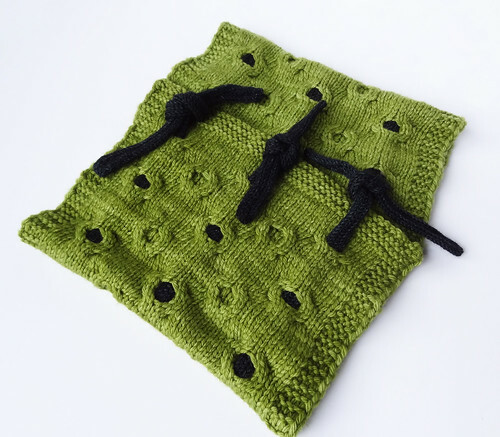 My sample was knit using i-cord because I wanted to play with my new knitting mill. There are full directions of how to thread the ribbons in order to tie the cowl properly. The pattern is knit in one piece using a straight-forward and interesting pattern, which would be a good first cable project. The pattern uses a single 100g skein of either worsted or aran weight yarn. The above sample was knit using Malabrigo Rios in the Lettuce colourway. 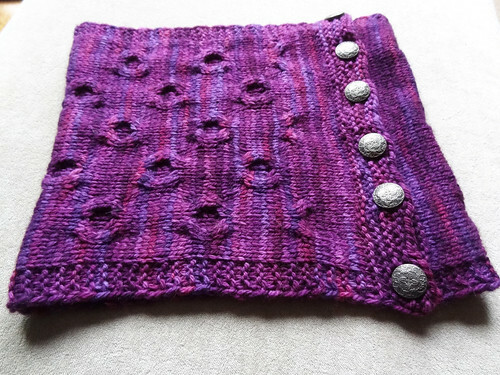 My other sample was knit using Babylonglegs Radiance in the Belladonna colourway. This option also uses buttons to close the cowl, rather than ribbons. One of my test knitters used both methods of closure to make sure the cowl is securely fastened with buttons and then adding ribbons as a purely decorative embellishment. There are full instructions for adding buttonholes to the pattern. The Babylonglegs Radiance yarn has an unusual effect where each yarn ply takes the dye in a different way. It results in a very complex and rich colour. The pattern can be downloaded via the Download page of this website, on Ravelry, and on Craftsy. The purchase option on Ravelry and this website is will be charged in GBP, £1.75. The price on Craftsy is charged in USD, $2.95. I hope you like this pattern as much as I do. I've been wearing both versions constantly this Winter. It's a great pattern to use up a single fun skein of aran or worsted weight yarn, that's a quick knit and perfect for a gift.